The weather’s turned cool and you’ve shifted from backyard barbecue to stovetop soups and stews. Now that the colors of autumn are all around, it’s a great time to update your décor for fall. Interior Designer Christopher Grubb of Arch-Interiors Design Group in Beverly Hills is used to styling the homes of his luxury-loving clients for all seasons. Here, he offers ideas on how to infuse warm hues and cozy textures into the home, helping you celebrate the harvest season no matter what your budget might be. Update picture frames. This is a great change if you use wood or fall colored frames, or a mixture as well. It brings new life to your existing photos, and you’ll see them in a whole new light. Fresh paint is always an inexpensive way to make a big impact. Think of adding a burgundy accent wall in the dining room, a terra cotta hue in the living room, or maybe a rich harvest gold in a breakfast nook. The options are unlimited. 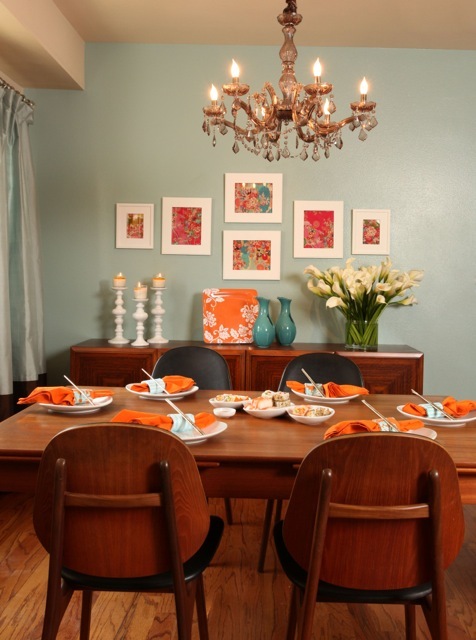 If you have a chandelier in the dining room, add some new shades in a rich, fall color. There are some very fun beaded ones that sparkle with the lights on or off. Find a great pattern for throw pillows with fall colors, and then complement them with solid colors. You can do this in the living room, family room, media room or bedroom. Add linens. Tablecloths and napkins in the dining room or breakfast nook make a big difference. Choose fall shades in a solid color with colorful complementary napkins, or vice versa. Switch out or add an area rug. If you have a solid colored one, choose a fun, patterned one for fall. Switch up your accent towels in the bath. It’s a simple way to add a fresh touch of fall color. Use a combination of solids and prints and accent them with a new floor mat. Fresh cut flowers can be costly, but they’re a great way to add a touch of any season to the home. One great thing to do is incorporate branches of leaves that are turning fall colors. They make a great statement and bring the outdoors inside. 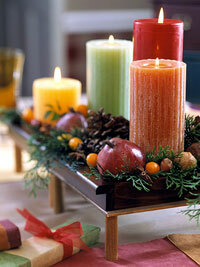 Also, arrangements of dried corns, nuts, and pomegranates instantly give a sense that the season is changing. If you’ve had the same sofas or side chairs for years, you can find affordable slipcovers with great fall colors or warm textures such as chenille. If you’re crafty, look into making your own. Slipcovers can make a big change in your home without the high cost of reupholstering. Plus, they can be washed and dried. Change drapes to a fabric with more weight to add warmth in any room. Velvet of chenille is a perfect fabric because of its thickness. You can add them as side panels on either side of a sheer drape. A new comforter with warm colors is a great way to bring fall into the bedroom. Mix with fall-hued throw pillows to give the effect of a complete room makeover. Add fresh new sheets in fall colors such as pumpkin, hunter green, chocolate brown, or deep gold for a reminder every night that fall is in the air. Accessorize! Start with your favorite fall colors such as burgundies, golds, browns, etc. Check out swap meets and garage sales for a mixture of glass vases or pottery. Group various colors and sizes together on a console, mantle, or coffee table. But be sure to remove some of the accessories you already have. Often we leave things out year-round and actually over-accessorize our rooms. Put them away temporarily and then add pieces of your own color scheme. This post was generously written by Beverly Hills Interior Designer Christopher Grubb from Arch-Interiors.com.